Coolestmommy's Coolest Thoughts is pleased to promote this giveaway hosted by Tammie's Reviews, Giveaways and More and sponsored by Hallmark. Who is your inspiration? My mom has always been an inspiration to me--especially as I got older and wanted to become a mother. As a child, I never understood the kind of sacrifice it took for her to be a stay at home mom. I just knew my mom would always be there for a carpool ride if I needed one, or a field trip chaperone, etc. There were often cookies freshly made and in the cookie jar when we got home from school. She was ready to hear about our day. And now that I have kids of my own, I realize the sort of financial sacrifice it takes to be a one income family. I'm now a part of that group and have been since my oldest was born. And on the days when the month is longer than the budget or when I'm really tired of doing 'one more volunteer thing at school' or driving one more carpool, I remind myself how blessed I was and pray that my kids have the same memories of me. I know I wasn't always the best daughter--hindsight is 20/20--but I always knew my mom would be there for me, no matter what. And that is the most inspirational and priceless gift she could have ever given to me. You can read Tammie's Reviews, Giveaways and More's review by clicking HERE. I cannot wait to hear about all the wonderful stories about who inspired you with their wisdom, their courage or even just an open ear. 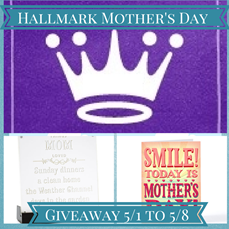 This giveaway will be live from May 1 through May 8, starting and ending at 7 p.m.
3 readers will win a Hallmark prize pack. My cousin was a really great inspiration and support system in my life.